Let’s address the first question first. 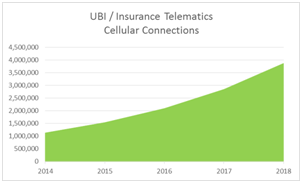 The current James Brehm & Associates estimates are that there are approximately 2.5 million usage-based insurance subscribers in the United States, and that the number of cellular connected gateways supporting those subscribers (most being OBD II devices) at the end of 2014 was roughly 1.13 million. Cellular connections supporting UBI are forecast to grow at an annual rate of 36 percent, totaling 3.87 million in 2018. While this may seem like strong and steady growth, the number pales in comparison to some of the other forecasted growth rates for both UBI and overall machine-to-machine communication markets that are currently in circulation. When you think about M2M applications in the automotive and transportation industry that have a great long tail effect and can provide tremendous value, the mind is immediately drawn to insurance telematics or UBI. Providing the insurer with real-time information on a vehicle’s location and state of being is incredibly valuable. That information enables stakeholders to know where a vehicle is at different times throughout the day. For example, it can enable them to learn if the car is in a high-risk location that’s prone to theft, whether it is parked, and whether it tends to be driven during daylight or nighttime hours. It can also reveal information such as at what speed the vehicle is traveling, how it’s starting and stopping, whether it was bumped or jostled, etc. – all of which can be factored together when determining rates. But aside from allowing the insurer to provide discounted rates (or raise the rates for risky behavior), what value do these metrics provide to the insured? As I was driving to do some shopping over the weekend, I looked at an overhead billboard on the interstate, which stated that there had been well over 3,000 traffic fatalities in Texas this year. I wondered just how many of those came from things that could be avoided by utilizing technology. Just then, a vehicle swerved into my lane and nearly cut me off, and I noticed that the teenage driver appeared to be texting while driving. Even though texting while driving is against the law in my city, it doesn’t seem to stop people from doing it. 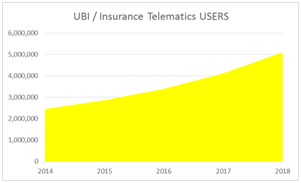 Over the past few months, I’ve done interviews with 31 carriers, nine MVNOs, more than 20 platform companies, and seven major insurers discussing UBI and telematics. Every one of those discussions, 100 percent of them, have a seemingly central theme of providing value to the insured. Often times, the discussion leads to wanting to be able to remotely lock or unlock the vehicle’s doors, to be able to track the vehicle’s location, or to disengage the ignition if it is lost or stolen. Sometimes, the discussion is as simple as how to create a better user experience or a sexier app for customers’ iPhones or making it easier for users to log in. Then the typical discussion turns to the portal. How do I provide my agents and my sales and customer service staff with a better portal experience? And how does this transition into a better end user experience for the insured? Can we drive more usage by adding gamification? Do we need to provide a white-labeled solution for large agencies? How do we handle resellers? But none of these really address the issue of providing value-added solutions to enhance the user experience. Value-added solutions can include such things as geo-fencing applications, anti-distracted driving software solutions, trip planners, and location-based apps that could even help one locate the cheapest gas prices. By working as an ecosystem to develop next generation solutions, insurers, software companies, telcos, and system integrators can ensure that new UBI solutions include next-gen features, such as anti-distracted driving software that don’t allow someone to text while driving. A UBI offering that prevents texting while driving could be a great solution for parents of teenage drivers and drivers in their early 20s who are still supported by their parents. That’s important because anti-distracted driving solutions can help prevent young drivers from being reckless when parents are not around. Additionally, the applications could provide telemetry readings and alerts to parents on things such as excessive breaking, speeding, careless driving, and turning without signaling. Because of the Hawthorne Effect, even the mere presumption of being watched may alter the young driver’s behavior for the better, and this is where value is derived. Providing something of value to the end user should serve the dual purpose of driving usage on the portal (improving ROI for the insurance companies’ development dollars), while preserving the value of the asset insured (both the vehicle and the driver). The greatest challenge with today’s UBI solutions is they don’t address both sides of the value equation. Today’s UBI business model is about increasing subscriber growth by utilizing technology to reduce cost, not in utilizing the technology to improve the amount of information gathered, the quality of information gathered, the end user’s driving experience, or shareholder value for the insurer. It’s simply a race to zero with new customer acquisition as the only factor in mind. While new customer acquisition is important, maintaining long-term customer relationships should not be overlooked. Currently, there are 339 million registered vehicles in the United States. The most recent figures show that at least 42.7 million uninsured vehicles and more than 14.6 percent of drivers are uninsured. And even though we are emerging from the most recent economic downturn caused by the subprime lending crisis of the late 2000’s, the average disposable income is much less than what it once was. Given that fact, many people are beginning to view their auto insurance premium as an optional expense, rather than one that has been mandated and is necessary to preserve their right to drive. The simple fact of the matter is that value-added services combined with lower rates will, in addition to increasing demand for insurance, improve the stickiness and reduce churn of existing subscribers to a lower rate plan of a competitor. Remember, there are three reasons why companies utilize machine-to-machine communication: to save money, to make money, or for compliance purposes. Often times, version one of a machine-to-machine solution is about saving money, reducing cost, and driving the price down. And that’s where we’re at today in the UBI space. Real shareholder value will only come in UBI version 2.0 when sticky, next generation, value-enhancing software solutions are included.